Through an eco-friendly natural extraction of bamboo fibres, we’ve created the softest hypoallergenic material for your skin. You can twist and shout in this wickedly wickable banana fabric tank top. It's got vibrant contrasting inner bra made from stretchable bamboo mesh that rises both out of the back, front and sides into a twister design with a racer back look that provides movability. The droop neck at the front is an elegant design, whilst the long length can be a practical option. The loose feel of the outer fabric provides increased breathability, without the loss of the inner support bra. The all over print design on the banana fabric adds a chic look. Keep the chill off your thighs with this practical biker short, ideal for all round yoga and fitness. Let the thermal regulating ability of bamboo keep your thigh muscles warm and supple whilst you loosen up and stretch them out allowing the excess heat to seep out through the incredible breathability of the natural based fabric. 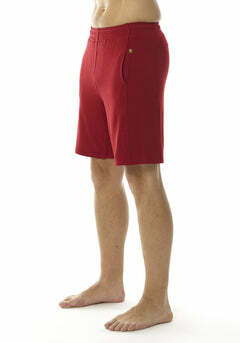 The shorts gathered design at waist sides helps to control excess fabric so you look streamlined all through practice. The wide waistband is a less tight way to keep the pants up without feeling the pressure on your tummy. You'll feel sleeky smooth in this flat seamed short with anti-chaff gussets at crotch and a small concealed pocket for your locker key or loose change. There's an Indian henna inspired embroidered tattoo at the back from which to draw balance and chi. Bold and beautiful. Whatever you're doing, we have got you covered. Free spin, headstands, tennis or running on the treadmill, this skirt&short.. skort! is fashion in motion with the bright bamboo mesh popping over contrasting smooth banana fabric. So you can enjoy the weightless support of the banana fabric and its super absorbent qualities, whilst feeling the stretchable bamboo mesh hold you from start to finish. The length of this capri goes beyond the knees and then flares out slightly, creating a stylish European look. The gathered designs at waist sides, in a vibrant contrast colour, retains enough tension to control excess fabric. Another wickedly wickable banana fabric tank top that's in an all over print design! We've put this super absorbent banana fabric into what a classical shape at the front, but then popped it with a cross back stretchable bamboo mesh strap design at the back for even greater ventilation and support. Gathering at back encourages you to align the spine in a pretty formation. Always with a stretchable bamboo mesh-lined support bra for anti-stink, anti-fungal, antibacterial with removable pads. What else would you want in a tank? Snuggle up in this breathable zipped hooded top. The soft organic cotton content will keep you cosy and warm, whilst the bamboo fibers weaved into the fabric will resist the build up of unwanted moisture, bacteria and odours. This hoody is slightly cropped so that the wide ribbed waist band sits on your hips.